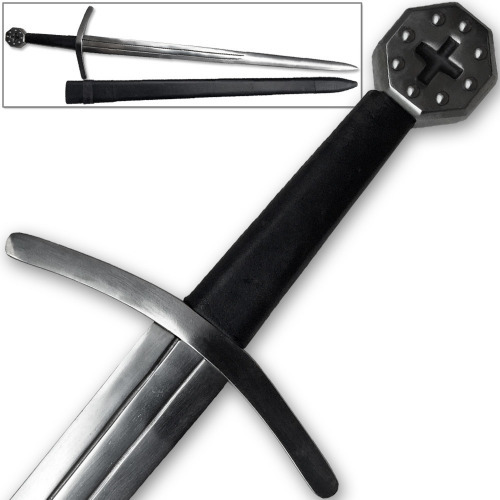 Medieval Crusader Full Tang Sword makes a nice display or presentation piece, or can be used in reenactment. Thick, Full Tang, Carbon Steel, blunt dull blade with double fuller. 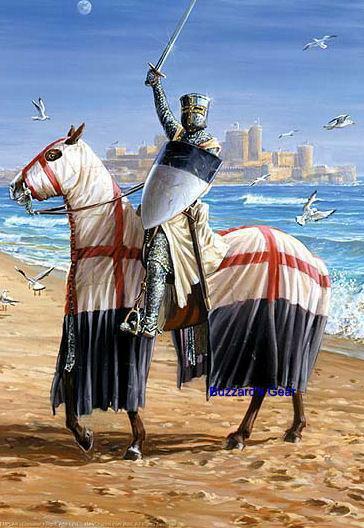 Medieval Crusader Full Tang Sword pommel features engraved crusader cross and solid metal studs. Guard is slightly curved and made of steel, polished to antiqued look. Handle is made of wood and wrapped in genuine leather - black. Comes with Black leather wrapped scabbard. Please note: Carbon Steel can Rust! May have some rust spots and this would actually be the mark of true functional carbon steel with antiqued finish.